Deadline to submit Application is December 5, 2018, for awards presented at the 44th annual conference in Austin, February 17-20, 2019 at the Wyndham Garden Hotel. TACHE recognizes graduate students, faculty, and staff at a community college and university. These are awards are selected based those individuals that submit an application for the individual awards. These awards are presented annually at the conference. Below is a list of each of the award categories. 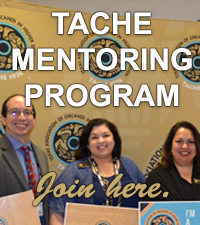 TACHE invites applications from Texas residents pursuing graduate studies in community college education/leadership, or other graduate or professional academic program. TACHE will award four $2,000 fellowships. Fellowships will be awarded to students whose emphasis is in community college education/leadership studies at the graduate level. Other fellowship awards will also be considered for students whose study emphasis is in university/post-graduate education (various fields) at the graduate level. Deadline to submit Application is December 5, 2018. The application for the fellowship is online. You will also upload your documents online. To review the criteria, documents you need and to apply for the Graduate Fellowship click on ONLINE APPLICATION. TACHE invites nominations/applications for the Distinguished Community College Faculty Award. The award recognizes superior levels of professionalism and accomplishment in the areas of teaching, research, or service. Any faculty member or administrator may submit a nomination. Individual faculty members may self-nominate. The application for the Distinguished Community College Faculty Award is online. You will also upload your documents online. TACHE invites nominations/applications for the Distinguished Community College Staff Award. The award recognizes superior levels of professionalism and accomplishment in the areas of initiative, productivity, critical thinking skills, effectiveness and customer service skills. Any staff, faculty or administrator may submit a nomination. A nominee must be classified as non-faculty. Individual staff members may self-nominate. The application for the Distinguished Community College Staff Award is online. You will also upload your documents online. To review the criteria, documents you need and to apply/nominate for the Community College Staff Award click on ONLINE APPLICATION. TACHE invites nominations for the Distinguished University Faculty Award. The award recognizes superior levels of professionalism and accomplishment in the areas of teaching, research, or service. Any faculty member or administrator may submit a nomination. Individual faculty members may self-nominate. The application for the Distinguished University Staff Award is online. You will also upload your documents online. To review the criteria, documents you need and to apply/nominate for the University Faculty Award click on ONLINE APPLICATION. TACHE invites nominations/applications for the Distinguished University Staff Award. The award recognizes superior levels of professionalism and accomplishment in the areas of initiative, productivity, critical thinking skills, effectiveness and customer service skills. Any staff, faculty or administrator may submit a nomination. The nominee must be classified as non-faculty. Individual staff members may self-nominate. To review the criteria, documents you need and to apply/nominate for the University Staff Award click on ONLINE APPLICATION.